Today, we spent half the day with Boyd and Gavioli exploring the ancient sites and piazzas of Siracusa/island of Ortigia, but then had the rest of the day to ourselves. 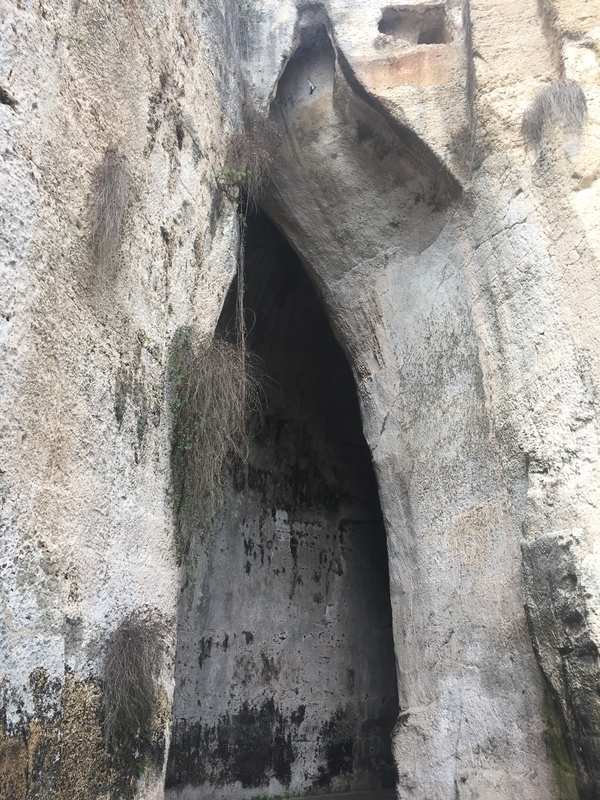 In terms of sites, we saw an ancient Roman amphitheater, which was being prepared for upcoming theatre performances, said as well as the “orecchio di Dionisio”, a quarry site said to house prisoners that Dionisio could eavesdrop on due to it echoey quality (pictured in this post). After the sites, we visited the main church in the central piazza of Ortigia, which was dedicated to their patron saint, Santa Lucia, known for her miracle of her statue crying. Next, we visited a small chapel with a famous painting done by Caravaggio depicting the death and burial of Santa Lucia, which somewhat demonstrated Caravaggio’s use of chiaroscuro. For the rest of the afternoon, we were free to explore Ortigia, so we grabbed some lunch and did a little shopping.